Members can rent out our spacious pavilion for parties, BBQ's and family get-togethers. *The fee includes the use of the grill and the first 5 nonmembers free and everyone after is $3.00. Maximum of 50 people. Stop by the Pool manager Office to fill out the Pavilion Rental Request or download out the Pavilion Rental Request and drop it off. 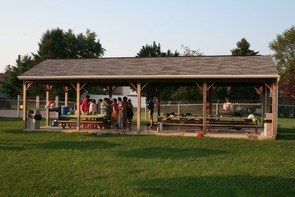 Willowood Swim Club Pavilion Rental Request HERE. Tired of dragging chairs, foam noodles, toys, sunscreen, umbrellas, you-name-it along to the pool? Store your stuff in our covered storage area. $10.00 per slot. You can put any pool items in the slot that fits. *Willowood Swim Club not responsible for stolen items. Please remove items at end of season or items will be disposed of at discretion of management. Basketball court, volleyball court, bocce ball, waffle baseball, waffle golf and shuffle board area.